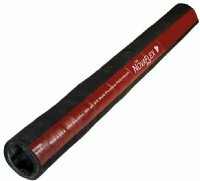 HP Petroleum Transfer Hose is a multi-purpose hose designed for suction and discharge applications that require working pressures up to 400 psi. This hose is both flexible with a lighter weight design and has an all weather cover which is resistant to oil, cuts, abrasion and gouges. This hose can have a UHMW wear cover added for additional abrasion resistance (U version). The tube is resistant to petroleum products with aromatic content to 55%.